South Carolina (20 December 1860). Mississippi (9 January 1861). Florida (10 January 1861). Alabama (11 January 1861). Georgia (19 January 1861). Louisiana (26 January 1861). Texas (1 February 1861). 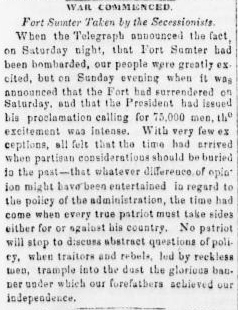 Secession of America’s southern states had begun, and the moments of simmering tension between the North and South which darkened the final days in office of President James Buchanan were about to boil over for the new administration of President Abraham Lincoln. 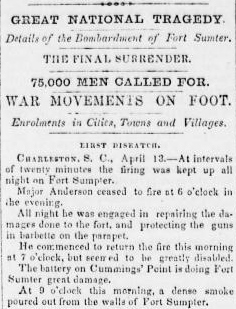 Fort Sumter had been in dire straits since Brigadier-General P. T. G. Beauregard directed his army to hamper operations of the federal government’s last stronghold in Charleston, South Carolina. By the time President Lincoln ordered the fort’s resupply, the U.S. soldiers stationed there were already low on provisions. When the U.S. Army still refused to evacuate, despite Beauregard’s demands, the guns of the Confederacy opened up and battered away from 12 April 1861 until U.S forces surrendered two days later. 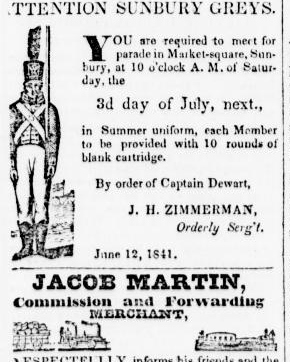 These Sunbury American newspaper clips (above: 1841; below: 1850) document the name change of the Sunbury Greys to Dewart Guards. Both were iterations of the Sunbury Guards. After Governor Curtin gratefully accepted Gobin’s offer, Gobin returned home to Sunbury finish his recruiting efforts. 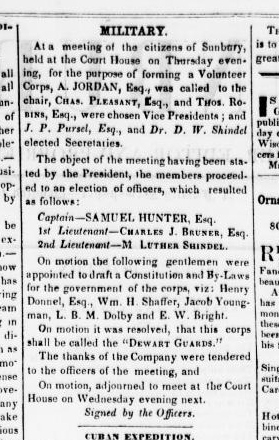 On Friday evening, 19 April 1861, the Sunbury Guards assembled in the grand jury room at the Sunbury Court House, where they unanimously elected Charles J. Bruner as Captain, J. P. S. Gobin as First Lieutenant and Joseph H. McCarty as Second Lieutenant. Sunbury American, 27 April 1861 (public domain). The next morning, Captain Bruner took 40 of his Sunbury Guards to the train depot and on to the state capital, making the Sunbury Guards the first military unit to leave Northumberland County to fight the growing southern rebellion. The town turned out early to give their fathers, brothers and sons a buoyant sendoff. The next day, led by Sergeant C. Israel Pleasants, the remaining 38 Sunbury Guardsmen worshipped at Sunbury’s Lutheran Church in preparation for their own train trip to Harrisburg on 22 April 1861. Reunited later that day, the 78 men-strong Sunbury Guards mustered in to service at Camp Curtin in Harrisburg on 23 April, and were designated as Company F in the 11th Regiment, Pennsylvania Volunteer Infantry (although they still employed their hometown Guards’ designation with pride). raise means for “providing for the families of the married soldiers, and furnishing clothing for those not provided with the articles necessary for a campaign. One thousand dollars were raised [on Friday evening, 19 April 1861], with a pledge to double it when necessary, and four hundred dollars for the immediate wants of the soldiers.” The manufacture of suitable clothing was at once undertaken by the ladies. In this work Mrs. Charles Pleasants was particularly active; she opened her house, and it became headquarters for the patriotic operations of the ladies. Here the work of cutting and making garments was pursued without cessation, day and night, and Sunday was observed by an increase rather than a diminution in the number of workers. The willingness of the women of the county to contribute their labor to the success of the cause was one of the most practical expressions of patriotism evinced at that period. It is a small town, situated about two hundred yards from the Philadelphia, Wilmington & Baltimore Railroad. We are, however, quartered at the railroad – the men in a large warehouse, the officers at the depot. The quarters are very comfortable…. We have two sentinels posted about three quarters of a mile below the quarters, and two a couple of hundred yards above, along the railroad, to watch the bridges and culverts. At night we increase the number. We have plenty of ammunition. It is forty-eight miles from here to Philadelphia. Illustration excerpted from Harper’s Weekly Falling Waters montage (27 July 1861, public domain). “Council of War” shows “Generals Williams, Cadwallader, Keim, Nagle, Wynkoop,” et. al. on the eve of battle. On 31 July 1861, the Sunbury Guards mustered out from their Three Months’ Service. The rebellion not quelled, many would re-enroll for three-year terms in a few short weeks, this time forming a core group of a new state infantry regiment, Company C of the 47th Pennsylvania Volunteers. Still known as the Sunbury Guards, they would be awarded the honor of bearing and protecting the national and regimental colors for the 47th Pennsylvania, and would fight heroically only to have their accomplishments minimized by historians. 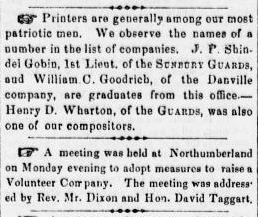 During the late 1870s, the Sunbury Guards were incorporated into the Pennsylvania National Guard, becoming Company E of the 12th Infantry Regiment. 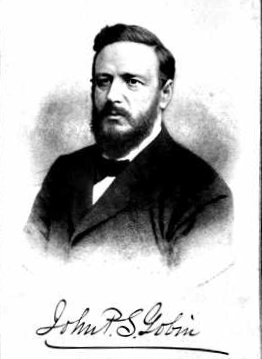 Company E was commanded by Sunbury native, Charles M. Clement, who was commissioned as Captain after initially enlisting with the Sunbury Guards/Company E as a Private in 1877. Promoted to Major of the regiment in 1896, Clement was advanced again in 1898 to the rank of Lieutenant Colonel. He was second in command when the regiment entered the Spanish-American War, and was promoted to the rank of Colonel and regimental Commanding Officer of the 12th Infantry after the war ended. Renamed as Battery A, 190th Field Artillery Battalion, 28th Infantry Division, U.S. Army during the 20th century, the “Sunbury Guards” continued to protect the nation long after the final echoes of Civil War bugles had faded. Latter day Sunbury Guardsmen were involved in the Battles of the Bulge, Ardennes and Hurtgen Forest, and still respond today when America’s President calls. 2nd Corporal Charles Doughty Wharton, Jr.
* Entered a different company from Pine Grove, Schuylkill County when not mustered in with Company F, 11th Pennsylvania Volunteers. Sources: Bates’ History of Pennsylvania Volunteers, 1861-5; Bell’s History of Northumberland County Pennsylvania; Civil War Veterans’ Card File, Pennsylvania State Archives, Harrisburg, Pennsylvania; Geographical and Biographical Annals of Northumberland County, J. L. Floyd & Co., Chicago, Illinois; Godcharles’ Freemasonry in Northumberland and Snyder Counties, Pennsylvania; Schmidt’s A Civil War History of the 47th Regiment of Pennsylvania Veteran Volunteers; Shamokin News Dispatch (“Two Dewarts Interested in Cameron Mine,” 5 October 1936), Shamokin, Pennsylvania; Sunbury American (1840-1922), Sunbury, Pennsylvania; The Daily Item (obituary: Charles T. Ressler, 3 March 2009), Sunbury, Pennsylvania.